MILWAUKEE, WI. (March 6, 2014) – In 1977, Harley-Davidson® created a ride-it-hard, put-it-away dirty, make-your-own-boundaries custom motorcycle that became an icon — the Low Rider® model. Today after a five-year hiatus the legendary Low Rider motorcycle returns, reborn with timeless Harley-Davidson custom cruiser styling and exciting new performance, primed to set free anyone who craves the taste of freedom. With an innovative ergonomic design that easily adjusts to provide a perfect fit, the new Low Rider motorcycle is a Big Twin for every rider. Available now as a mid-year 2014 model, it’s absolutely, unmistakably Harley-Davidson. 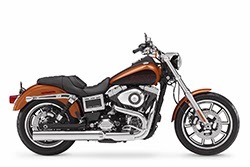 The new Low Rider responds with assertive authority to rider input, the unrelenting thrust of its Twin Cam 103™ powertrain harnessed in an agile Harley-Davidson Dyna® chassis. Michelin® Scorcher™ tires are mated with suspension calibrated for all-day comfort and precise handling, featuring stout 49mm forks and new coil-over rear shocks, both with tri-rate springs. Dual front disc brakes deliver ample stopping power. Sculpted header pipes feed a 2-into-1 exhaust that emits a satisfying, throaty tone. Stop light-to-stop light or on the open highway, the Low Rider delivers exhilarating performance. Informed by the same accelerated, customer-led product development process that propelled Project RUSHMORE, the new Low Rider is designed to fit a broad range of riders in a confident, comfortable riding position straight from the factory. Harley-Davidson leveraged the science of ergonomics to develop a “perfect fit” rider position utilizing three key features: a two-position seat, an adjustable handlebar riser, which can each be easily adjusted by the dealer using simple hand tools, and footpegs that are relocated two inches forward. The Low Rider still lives up to its name; seat height is just 25.4 inches. Computer-generated rider triangles representing the extremes of the biometric targets — 5’ 1” to 6’ 1” in height — were overlaid on the Dyna chassis. These triangles depicted not just the reach of the respective riders, but also the more critical comfort zones within the range of reach. Harley-Davidson Engineering and Styling departments next collaborated on the design of a seat with a removable bolster, secured by two concealed screws, to provide the desired range of seating position. A new headlamp visor bolts to the upper triple clamp and provides the fixture to support the adjustable handlebar riser, secured by four easy-access hex-head bolts. The original Low Rider set a styling benchmark when it was introduced in 1977, and Harley-Davidson designers went back to that milestone motorcycle for inspiration in creating a new Low Rider with a look that’s timeless and authentic. •Rubber-mounted Twin Cam 103™ engine is rated at 99 ft. lbs. of torque at 3500 rpm. The engine is equipped with Electronic Sequential Port Fuel Injection (ESPFI) and Automatic Compression Release (ACR), and is mated to a 6-speed Cruise Drive® transmission. The powertrain is finished in wrinkle black powder coat with chrome-plated covers. •Unique handlebar riser offers 2.4 inches of adjustment and seamless integration. •Two-position ergonomic seat is tuned to fit a broad range of riders with a removable bolster that moves the rider 1.5 inches forward; laden seat height is 25.4 inches. High-performance perforated seat cover features a classic stitching pattern. •Mid-mount foot controls are positioned to best fit most riders with an in-command riding position. •Chrome 2-into-1 exhaust emits a throaty sound and pays homage to the original Low Rider. •Wrinkle black console holds an analog speedometer and analog tachometer. Indicator lights are integrated into the tachometer. •Chrome-plated rear fender strut covers feature wrinkle black cutouts. •Chrome-plated battery box insert with wrinkle black highlights. •Suspension features 49mm front forks and coil-over rear shocks, both with tri-rate springs; each tuned to deliver all-day comfort and excellent performance. •Custom ignition switch located on the left side of the motorcycle. •H-D® Smart Security System with hands-free, proximity-based security fob as a factory-installed option. •Anti-Lock Braking System (ABS) is a factory-installed option, standard in select markets. •Color choices include: Vivid Black, two-tone Brilliant Silver/Vivid Black and two-tone Amber Whiskey/Vivid Black.